The following is the text from the Celtic Heroes game help file. You are a hero who hails from the Highlands, and has travelled to the land of Lir's Reach in Dal Riata in order to answer the call for brave individuals to protect the lands from darkness and evil. With the Celtic lands in turmoil and under attack by dark forces, the need for heroes has never been greater. Now is the time for you to rise. Now is the time for you to save the Kingdom. Now is the time for you to become a Celtic Hero! 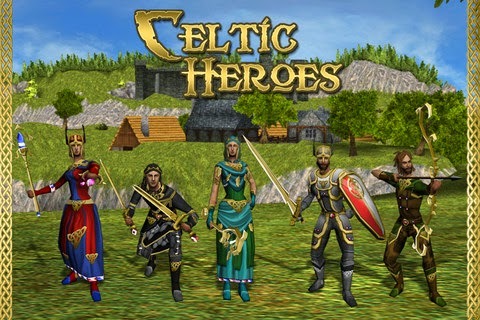 In Celtic Heroes you create a character and lead them on fantastic adventures through the ancient Celtic world. As you explore the world you will be able to take on epic quests, defeat evil enemies, and gain new items, weapons, and armour. On your quest you will become more powerful, improve your skills and abilities, gain access to uncharted areas, and perhaps make some new friends as well! By defeating enemies and completing quests you will gain experience points, or XP. When you gain enough XP you will increase your character's level, and will earn points which can be placed into different stats to help grow your character. Your character's health is represented by a green bar at the top of the screen. When your health reaches 0 you will die, but don't worry! If this happens you'll simply be resurrected at the nearest Leystone. Alternatively, if you have a Resurrection Idol in your Inventory you can use one to restore your character without being transported to a Leystone. After you resurrect you will notice a small marker underneath your health bar; this is the "Resurrected" status effect, and it simply informs you that you have died recently and has no impact on your gameplay. After a small period of time this status effect will disappear. However, if you die whilst you have the Resurrected status effect you will receive the "Curse of the Fallen". This curse will reduce your maximum health for a period of 1 to 2 minutes. If you continue to die whilst the Curse of the Fallen is active, your health will continue to decrease until it reaches 20% of your original maximum health. Energy is what you use in order to cast skills - special abilities and spells which can give you an edge over your opponent - and is represented by a blue bar at the top of the screen. Each skill requires a certain amount of energy to use, and if your energy drops to 0 you won't be able to use any more skills. Both your health and energy regenerate slowly over time. However, you can purchase items from the Item Shop which increase your rate of regeneration, or provide you with a one-off boost of either health or energy. The heads-up display, or HUD, is a set of on-screen indicators for various pieces of in-game information. At the top of the screen, you will find the green health bar and blue energy bar. Underneath these is the orange experience bar, which shows you how much XP you have received at your current level, and how much more you need in order to reach the next one. Sometimes your character may be under the influence of various status effects. When this occurs, these effects will be displayed underneath your experience bar. To the left of the health and energy bars, you'll find a button which opens and closes the Chat Log. This button is represented by the letters ABC, and tapping it once will open the Chat Log, whilst tapping it a second time will close the Chat Log. On the right-hand side of the screen is the Hotbar. This is where your skills and consumable items, such as potions, are displayed. In the bottom right-hand corner of the HUD is the Action Button, which you use to interact with the world. The button, and its action, will change depending on what target you have selected. If you have selected a target or another player, their name and current amount of health will be displayed along the bottom of the screen. In the bottom left-hand corner you'll find the joystick, which is used to control the movement of your character. The joystick sits upon a compass, which displays your bearing, and around the outside of the compass you will find icons which show the relative location of any points of interest, for example available quests or shops. These icons will increase in size the closer you get to a particular point of interest. On the left-hand side of the screen you will find the 4 menu buttons. The top button will take you to the Main Menu, whilst the second button will bring up the Social Menu. The third button opens the Chat Menu, and the fourth button will show you the Emoticons Menu. For more information about any of the HUD elements, please see the relevant sections in the help menu. You move your character around the world of Celtic Heroes by using the joystick, located in the bottom left-hand corner of the screen. To use the joystick, simply touch it and then move your finger in the desired direction to make your character move. Moving the joystick by a small amount will make your character walk, whereas moving it towards the edge of the compass will make your character run. You can move the camera, which changes your viewpoint, by pressing and moving your finger anywhere else on the screen. This allows you to freely look around the environment. The camera has been designed to be used at the same time as the joystick, which means you can move your character and look around the world at the same time. The Action Button is the large button which can be found in the bottom right-hand corner of the screen. It is used to interact with the environment, as well as the various characters and creatures that can be found within Celtic Heroes. The function of the button will change depending on the target you currently have selected. When you select an enemy, the Action Button will appear as a sword. If you tap the button when you have an enemy selected, you will begin to attack the selected enemy. If you have selected a friendly non-player character (NPC), the Action Button will appear as a speech bubble. Tapping the button will move your character towards the NPC and will begin a conversation with that character. On your adventures throughout the world of Celtic Heroes, you may come across several items. Tapping on one of these items will turn the Action Button into a hand, and if you tap the button whilst it is a hand you will pick up the item and it will be added to your Inventory. Finally, if you select another player the Action Button will appear as a magnifying glass. Tapping the button will bring up an information screen which allows you to view the selected player's equipment, as well as their character name and level. From this screen you can also trade with the selected player, send them a whisper, block them, add them as a friend, invite them to a group or clan, or challenge them to a duel. The Hotbar, found on the right-hand side of the screen, is where all of your equipped skills and consumable items are displayed. You can equip skills and items through the Skills page, which is found in the Main Menu. For more information on how to equip skills and items, please refer to the Skills section of the Help menu. Skills and items fall into several categories. There are ones which target yourself, ones which target enemies, and ones which target other friendly players. There are also skills which affect an area, and some skills which only target friendly players who are in your group. If you have no currently selected target you will be targeting yourself. Tap on the relevant skill or item in order to use it on yourself. If you wish to use a skill or an item on an enemy or friendly player you first need to select them by tapping on them. Once they have been selected, simply tap on the skill or item you wish to use. Once a skill has been used it must recharge before it can be used again. This is represented by a red visual effect over the skill icon. This timer will reduce as the skill recharges, and when it is present you will be unable to use the skill. Once the timer has disappeared the skill has recharged and you can use it again. Emotes are a fast and fun way of communicating with other people in Celtic Heroes. By using emotes your character can wave, bow, salute and even tap dance! To use an emote you need to access the Emote Menu, which is found on the left-hand side of the screen and is represented by three red exclamation marks. Once you have opened the Emote Menu, simply tap on the emote you wish to use and your character will perform that action in the game. You are able to chat to other players in Celtic Heroes, whether that be a whisper to a friend or shouting to the entire zone about the dragon you just defeated! To start chatting, simply open the Chat Menu. This can be found on the left-hand side of the screen, and is represented by a speech bubble. Tap on the icon to open the Chat Menu. In the Chat Menu you will find several options. The first option, Say, allows you to talk to the nearby area and is not directed towards any one player. Shout allows you to make an announcement that everybody who is currently in the same zone as you will see. If you have received a private message, or whisper, from another player, you can reply to their message by selecting the Reply option. When you are in a group, the Group chat option will be available to you. This provides you with the ability to send a message to all the players who are currently grouped with you. If you are a member of a Clan, you can send a message to your Clan mates by selecting the Clan option in the Chat Menu. Selecting any of these options will bring up the keyboard. Simply type your message, hit the 'return' button, and your message will be sent. To send a player a private message, which only they can read, firstly select the player you wish to send a message to. Tap the Action Button (which should look like a magnifying glass) and from the screen that appears select the option which says 'Whisper'. This will bring up the keyboard, which you can use to type and send your message. In the event that you wish to cancel a message that you have already begun to type simply tap on the Chat Log button (represented by the letters ABC), and this will remove the keyboard. The mailbox system allows you to send and receive messages, items and Gold. You can send mail to other players on your world, or to any of your characters who are on the same world. To send or receive mail you must first visit a mailbox. There are mailboxes located throughout Dal Riata, and they are indicated on your compass as envelopes. Every piece of mail you send requires at least one postage stamp. If you want to include some items in your mail you will have to purchase one extra postage stamp for each item. Postage stamps cost 10 Gold each and can be purchased from any mailbox. Sending Gold via the mail system does not require any additional postage stamps. When you receive a mail, you will see a small mail icon next to your health bar. You can also enable push notifications in the Options menu, which will inform you when you receive a mail even if you are not logged into the game. The Inventory, which is accessed from the Main Menu, is where you store and equip all the items that you purchase or collect during your adventures. When you open the Inventory, you will notice it is divided into two halves. On the right-hand of the screen you'll see all the items you currently have in your backpack. Your backpack is divided into three categories: Armour, Weapons, and Other. You can switch between the categories by tapping on them. To view the details of any item simply tap on it, and if you wish to move an item you can do so by pressing on it and dragging it. On the left-hand side of the screen you'll see a portrait of your character. Surrounding this portrait you'll see some slots, the number of which will depend on what category you are viewing: Equipment, Jewellery, or Fashion. In these slots you can place, or 'equip', items. When viewing the Equipment category you will see slots for your weapon, shield (or other off-hand item), and armour for your torso, legs, head, hands and feet. The Jewellery category has slots for one necklace, one charm, two bracelets, and four rings. The Fashion category has slots for you to equip fashion items for your head, torso, hands, legs, and feet. To equip an item, drag the item from the right-hand side of the screen and drop it over your character portrait. To unequip an item, drag the item you wish to unequip back to your inventory. You can also equip and unequip items by tapping on the desired item, and then selecting the 'Equip' or 'Unequip' button. To dispose of an item, select the item by tapping on it and then press the 'Drop' button. This will remove the item from your inventory. If you accidentally drop an item, you can contact the Support Team using the in-game tool and they will be able to restore it. The Stats page contains all the main pieces of information about your character, including your character name, level, the amount of Gold and Platinum you currently have, as well as your current statistics: Health, Energy, Attack, Defence, Damage and Armour. The four main attributes which govern your character, and which determine your statistics, are also found here. On the Stats page you can assign and commit the Attribute Points you receive from levelling up to these four attributes. Once you commit the points your statistics will change. Strength determines the amount of damage your character does, both in melee and ranged combat. Rangers, Rogues, and Warriors will want to put points into Strength. Dexterity determines your chance to hit an enemy, as well as your chance to evade an enemy's attack. The higher your Dexterity, the more likely you are to successfully hit an enemy in combat and the less likely they are to hit you. This is a useful attribute for all classes, particularly those who are likely to be involved in combat. Focus determines the total amount of Energy your character has in order to use skills and cast spells. Druids and Mages will want to put their points into Focus. Vitality determines the total amount of hitpoints (health) your character has available. When your hitpoints reach zero, your character dies. Whilst death in Celtic Heroes is temporary, this is a useful attribute to put points into for each class especially those who are likely to take a lot of damage. Each of these attributes can have an effect on the power of your skills. If you look at a particular skill it will tell you which attribute is governing the skill. Increasing that particular attribute will then increase the power of the skill it governs. The Abilities page shows you all the abilities your character currently has and their level, as well as your Resistances, Skill Protection and PvP Rank and Rating. Abilities represent your level of aptitude for particular weapons and skills. Every weapon and skill has an ability that is associated with it (for example, swords are linked with the Sword ability), and by acquiring an ability your character can begin to use their weapons and skills more effectively. In order to gain an ability you have to visit a trainer. There are many different trainers that exist throughout the land of Celtic Heroes. Whilst some of them will offer their training for free, most will charge a fee. Most trainers will also only train characters of a certain class, so you may have to search a short while for one who is able to train you. When you acquire an ability it starts with a level of 0. However, this level will increase as you use the ability. For example, once you have acquired the Sword ability using a sword in combat will increase the ability's level. For every level your character has they can gain up to ten levels for an ability. Resistances work like armour, as they reduce the amount of damage you receive. Each Resistance reduces a certain type of damage. For example, your Crushing Resistance reduces the amount of Crushing damage you receive. The higher your resistance, the less damage you will receive. You can increase your resistances by equipping certain items or pieces of armour. Skill Protections provide you with a chance to avoid skills of a certain type. There are 5 different types of Skill Protection; each one helps you avoid a different type of skill. For example, Physical Attack Evasion will help you avoid direct damage skills which have a physical source. There are also 5 abilities which govern these Skill Protections. Once you have learned these abilities, their level will increase when you a targeted by a specific skill that is associated with the Skill Protection that is governed by that ability. For example, the ability Reflex governs the Skill Protection called Movement Attack Evasion. Therefore, when you are targeted by a skill which effects your movement your Reflex level will increase. This will in turn make your Movement Attack Evasion more powerful, meaning you are more likely to avoid skills which affect your movement. Your PvP Rank can be thought of as your PvP Level. Every time you win a PvP fight, whether it is a duel or in the Arena, you will gain experience. When you have enough experience your PvP Rank will increase. If you lose a fight you will not lose any PvP experience, nor will your rank go down. However, your PvP rating will go down. Your PvP Rating is a measure of how well you are doing in PvP. If you have won a lot of PvP fights and not lost many, you will have a high PvP Rating. On the other hand, if you have lost a lot of PvP fights you will have a low PvP rating. As you play through the game you will come across non-player characters (NPCs) who will have quests for you to complete in exchange for a reward. A quest is a challenge or task, and may involve such things as defeating a certain number of enemies, collecting some items, or delivering a message to another NPC. Quests are started by talking to an NPC who has an available quest. These NPCs have a yellow exclamation mark above their head, which is also visible on the compass and the Map. When you talk to an NPC with a quest they will provide you with a description of what they would like you to do, and give you the option of accepting or rejecting the quest. If you accept the quest, it will be added to your Quest Log and the NPC will have a grey question mark above their head. Once you complete the conditions of the quest the NPC will have a yellow question mark above their head, and you will be able to turn the quest in by speaking to the NPC and gain your reward. You can accept more than one quest, and can have a number of 'active' quests at any one time. The Quests page (or Quest Log) shows you a list of your currently active quests. The active quests are displayed in a list down the left-hand side of the page. Tapping on a quest will bring up the quest completion details on the right-hand side of the page. When you complete a quest stage, that stage is marked with a tick which allows you to chart your progress through a quest. After a quest is completed it is removed from the Quest Log. The Skills page displays what skills and consumable items you currently have available, and which are equipped to your Hotbar. Skills are special talents or magical spells which your character can use to help tip the tide of battle in their favour. During the course of your adventure you will gain numerous skills. To get more skills you have to learn them. Skills are learned by reading skill books, which you will discover as you play through the game. Once you have acquired a skill book, you can learn that particular skill. To learn a skill, go to your Inventory and tap on the skill book you wish to use. In the information box which appears, tap 'Use'. This will make you learn the skill. Once a skill has been learned you can equip it to your Hotbar. To equip skills to your Hotbar, go to the Skills page. Drag the skill you wish to equip from the right-hand side to one of the 8 Hotbar slots, which are on the left-hand side of the page. To use a skill simply tap its icon in the Hotbar whilst playing the game. Consumable items are items which grant a particular effect on yourself or another character, but disappear from your Inventory once they have been used. They can be used in two ways: from the Inventory or from the Hotbar. To use a consumable item, such as a potion, from the Inventory simply tap on the item, and then tap "Use" in the information box that appears. Be aware though that the game will not be paused when you do this, so make sure you are somewhere safe! To use an item from your Hotbar, you first have to equip the item. To do this, go to the Skills page, tap on the "Items" tab, and drag the item you want to equip to one of the available Hotbar slots. You can then use the item by simply tapping on its icon in the Hotbar. Once an item has been used up, it will disappear from the Hotbar. To begin with, you can equip a maximum of 8 skills or items. If you wish to equip more, you will need to purchase extra Hotbar slots from the Item Shop. The Item Shop is where you can purchase Platinum, as well as special items and character enhancements that will make you the envy of Dal Riata! The Item Shop functions just like a regular in-game shop. Categories of items are displayed on the right-hand side of the screen, whilst available items are displayed on the left-hand side. All the items have their cost in Platinum shown next to them, whilst the amount of Platinum you currently have is shown at the bottom of the screen in the right-hand corner. The Item Shop is useful if you want to defeat a particularly tough monster, speed up your progress through the game, or buy a treat for yourself or a friend. If you have an issue with the game, such as an accidentally dropped item, you can use the Support Tool to contact our Support Team. The team will then take a look at your issue and try to solve it. Go to the character select screen. You can reach this by selecting Log In instead of Continue from the Main Menu screen. Select the icon on the left-hand side of the screen which looks like 2 gears. Select the option which says Register E-mail. Fill out the required information, and select Register E-mail. You will receive an e-mail confirming your address has successfully registered. To use the Support Tool simply tap on Support, fill out the requested details and hit send. The Support Team may send you a message regarding your issue, which will appear as a pop-up on your screen. Please ensure you only send 1 support request per issue. Please do not send multiple requests about the same issue. Doing so will slow down the process of dealing with your request. The Map gives you a bird's eye view of the world of Celtic Heroes. You can see any of the Leystones you have discovered, your own location, the locations of trainers, traders, quest-givers, and much, much more. The large red markers indicate "zone points" - areas where you can travel to other zones. The smaller blue stones indicate the location of Leystones. By tapping on a large marker you can view the map for that area. You will only be able to view the whole map for an area if you have already visited it. Tapping on a blue stone will transport you to that location. Only Leystones which you have already discovered will be shown on the map. More information about Leystones can be found in the "Fast Travel" section of the Help menu. The Options page allows you to configure the settings of the game, as well as get back to the initial character select screen. Key to playing Celtic Heroes is the ability to 'fast travel'. This allows you to instantaneously travel from one point in the game world to another. Fast travel is very useful, but it does have some restrictions. More information on how to fast travel can be found in the "Map" section of the Help menu. You can fast travel from anywhere in the game world. However, you can only fast travel to a number of preset locations called Leystones, which are represented by tall, glowing grey stones covered in carvings. To be able to travel to a Leystone you must first discover it. When you discover a Leystone, a pop-up will appear and inform you that you have discovered one. From that point you will be able to travel to that Leystone. If you have more than a certain number of items in your inventory you will not be able to fast travel. This is because the extra items will disrupt the lines of magical energy which are used to transport you about the world. You can find out what your fast travel limit is in the Stats page. Items which are equipped do not count towards your fast travel limit. You can increase your fast travel limit by purchasing certain items from the Item Shop. The one exception to the fast travel limit is the courtyard in Farcrag Castle - you can always fast travel to this location regardless of how many items you are currently carrying. Your class in Celtic Heroes represents the broad profession of your hero, and where your abilities lie in combat. There are 5 different classes to choose from: Druid, Mage, Ranger, Rogue, and Warrior. Druids are spellcasters who are in tune with nature and the natural world. Whilst they possess some spells that deal damage, their main focus is on casting enchantments that boost themselves and their allies, heal their allies, and spells which hinder their enemies. Mages are elite spellcasters who channel fire and ice to defeat their foes. They have an arsenal of powerful spells which deal damage, boost the damage of their allies and weaken their enemies' defences. Rangers are hardened individuals who are at home in the wilder parts of the world. They fight from range using bows, and they have skills that slow down their enemies. Rogues are thieves and assassins who are experts in the art of stealth. They strike their enemies with deadly force, attacking quickly and powerfully whilst avoiding retaliation. Warriors are tough melee fighters who aren't afraid of going toe-to-toe with the most fearsome of foes. They wear heavy armour which allows them to take a lot of damage. However, this leaves them with little energy for using skills. During your adventures in Celtic Heroes you will encounter many different types of weapons and armour that your character can use or wear. Most weapons and armour can be used by any character, but there are a few things to be aware of when choosing what items to equip. Class Restrictions - Some weapons and armour can only be used by a certain class. For example, the armour that you start the game with is specific to the class you have chosen. If you find a piece of class specific equipment you will only be able to use it if you are the right class. Stat Restrictions - Some weapons and armour have stat restrictions on them. You will only be able to use an item if your base statistics match the requirements of that item. Note: items that increase a certain statistic do not increase your base statistic, and so do not count towards meeting the stat requirement of items. Weight - Although weight is not necessarily a restriction, it is an important factor in choosing what weapons and armour you use. Every item that you can equip has a weight value associated with it. These values add up to a "Total Weight" which is shown on your Stats page. Weight affects the total amount of energy you have available, and therefore affects your ability to use skills. Skill-orientated classes, such as Druids and Mages, will want to try and keep their Total Weight low so as to maximise their energy. On the other hand, Warriors may prefer to sacrifice some of their energy in exchange for the benefits that heavier armour provides. If you have enjoyed playing Celtic Heroes with another player you can add them to your Friends List. This will allow you to easily find each other in the future. To add a player to your Friends List, first select the player by tapping on them. Then tap on the Action Button. This will bring up an information screen about that character. Now, simply tap on the "Add Friend" button on the right-hand side of the page. This will send a friend request to the selected player. If they accept the request they will be added to your Friends List, and you will be added to theirs. To view your Friends List, select "Friends" from the Social menu page. This will present a list of your Friends. A red dot means that friend is currently offline, whilst a green dot means they are online. Tapping on a friend will produce a list of available ways that you can interact with your friend, from trading to chatting to forming a group. When you are logged in to the game you can identify your friends by the blue 'friend' symbol that appears over their heads. You can form groups with other Celtic Heroes players if you wish to adventure in dangerous dungeons or tackle a particularly difficult monster. Most 'elite' enemies in Celtic Heroes are designed to be handled by a group of players. To form a group, firstly select the character you wish to group with by tapping on them. Then tap on the Action Button. This will bring up an information screen about that character. Now, simply tap on the "Invite to Group" button on the right-hand side of the page. This will send an invitation to the selected player asking them to join your group. If they accept you will form a group with that player. Players in your group will have a blue 'group' symbol above their heads. Their location will also appear on your compass so you can track them if you become separated. When in a group with other players, you will share the XP from each mob you defeat with the other members of your group. However, when in a group a mob will reward a greater amount of XP then if you fought it by yourself. Therefore it is always a good idea to tackle the various monsters of Dal Riata when grouped with other players. Any loot you gain as a group will be randomly assigned to a player. To leave a group, select "Group" from the Social menu page. This will present a list of everyone who is in your group. Select one of the group members, and then tap "Leave Group" from the menu that appears on the right-hand side of the page. You will then leave the group. The group will not be disbanded however as long as it still has more than one member. A clan is an organised group of players who have joined forces in order to play together on a regular basis. They can offer many benefits such as opportunities for groups, meeting new friends, and sharing adventures that you may not have had if you were not part of a clan. To form a clan, tap on the "Clan" button in the Social menu. This will take you to the Clan page. From here you can tap "Create Clan" button to start your clan. However, in order to form a clan you need a Clan Banner. This can be purchased from the Item Store. When you form a clan you will be the only member in the clan. To expand your clan you need to recruit new members. To invite a player to your clan, firstly select the character you wish to invite by tapping on them. Then tap on the Action Button. This will bring up an information screen about that character. Now, simply tap on the "Invite to Clan" button. This will send an invitation to the player, and if they accept they will join your clan. The Chieftan is the founder of the clan. They can invite new players, remove players from the clan, and promote Clansmen to the rank of Guardian, or demote Guardians to the rank of Clansman. Guardians have the authority to invite new players to the clan, as well as remove Clansmen from the clan. Clansmen are the most common rank in a clan. They cannot invite new players or remove players from the clan. When you are playing Celtic Heroes any player who is in a clan will have the name of their clan displayed in brackets next to their name. Developed by One Thumb Mobile. Copyright 2011 - 2013 One Thumb Mobile. All rights reserved.